Following up on rumors circulating earlier this week, a report on Wednesday claims Apple has indeed rented out the large Bill Graham Civic Auditorium in San Francisco for its upcoming iPhone event. Citing a "trusted source" who provided documentation concerning event logistics, local publication Hoodline reports Apple is renting out the building through Sept. 12, giving the company more than enough time to set up and break down a large press event. The same publication on Monday suggested Apple could be behind a "private event" to be held at the auditorium from Sept. 4 through Sept. 13. 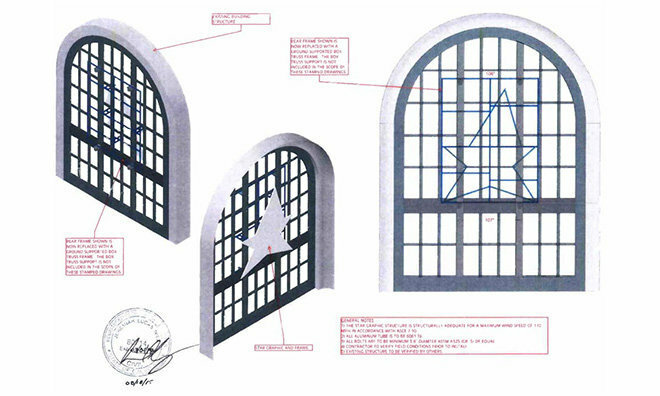 Documents unearthed this week show plans to modify four windows at the venue to support 15-foot logos. While mock-up images reveal a malformed star shape logo not known to be assigned to any one company, Apple's marketing iconography would fit well over the proposed subframe. With a capacity of about 7,000 people, the Bill Graham Civic Auditorium is a much larger venue than those traditionally used by Apple to host its annual iPhone announcements. For example, San Francisco's Yerba Buena Center can hold 1,470 people, while the site of last year's debut, Flint Center in Cupertino, can accommodate 2,400 visitors. If the rumors are true, Apple is planning something big, as Hoodline reports of multiple street closures in the area starting from 6 p.m. on Tuesday, Sept. 8. Apple normally holds iPhone announcements on Tuesdays, but that could change in 2015 with streets surrounding Bill Graham Civic Auditorium closed on Wednesday, Sept. 9 from 4 a.m. to noon. Apple is widely expected to announce next-generation "iPhone 6s" and "iPhone 6s Plus" devices at a special event in September, potentially alongside an entry-level 4-inch smartphone. Also rumored for inclusion is a new Apple TV version with touchpad remote, Siri support and a dedicated App Store.